If you're from the south burbs, you've likely at some point visited Aunt Sally's for breakfast. 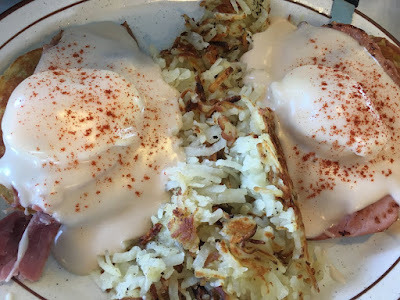 For decades they've been serving up hearty breakfasts to hungry (sometimes hungover) diners with all the classic plates that you love to eat early in the morning. While my sister was in town recently, I met her and my mom there and I got a simple plate of eggs and hash browns and toast. But my mom ordered eggs benedict - which was delivered as a HUGE portion with the biggest pieces of Canadian bacon I've ever seen. Aunt Sally's is worth a visit if you're in the mood for a plate of steak and scrambled eggs, an omelet, some French toast or a big stack or buttery pancakes to fill you up before you start your day. They are open through lunchtime.